I’ve hosted an Easter meal for years. Because while I am not a big fan of ham (I borderline hate it), I love getting family together, and I love the flexibility of Easter. A springtime brunch or dinner has so many variations — and as long as there are deviled eggs, no one seems to care much if you experiment. These days, my bigger concern is whether my son can have everything (or nearly everything) that’s on the table. 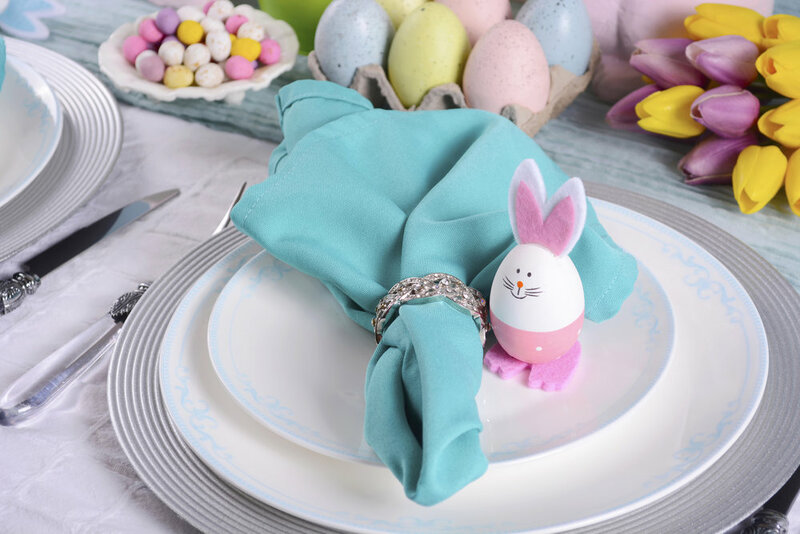 As the host, I feel it’s my responsibility to ensure that the Easter table is safe for him. And I welcome that responsibility (and sometimes challenge). Of course, if you have a 2-year-old, you know they’re picky little buggers who don’t eat much. I mean, he’s probably not going to touch the asparagus, so I probably could use butter. Then again, there was that one time he ate five stalks of asparagus at his birthday party. So, with the exception of the deviled eggs, everything will be allergy-friendly. These days, our allergies are eggs and dairy, but if you also have nut, peanut, soy and gluten on your list, there are lots of options. Here are just a few ideas to pull from this Sunday. Snack tray – I really do miss cheese trays, but olives, marinated mushrooms and cured pork products make a perfectly lovely board of munchies. You can add things like pickles, roasted red peppers, grapes, hummus and toast points or crackers, too. It can look fancy with very little effort. Baked ham – It’s not my favorite, but it’s easy to do without any allergens, so there’s that. Pork tenderloin – If you can get your family to skip the ham, here’s one great easy option for pork tenderloin. Roasted potatoes – I personally love Yukon Golds for roasting. Just toss in olive oil and your choice of herbs, and bake for 25-30 minutes. Rice pilaf – My son gets enough rice during the week, but a rice pilaf can be colorful, and you can incorporate the veggies of your choice. Green beans – sauteed or steamed. I like to add bacon or lemon juice and garlic. Sauteed veggies – Again, chef’s or (who are we kidding here?) kids’ choice. Pancetta-wrapped asparagus – Asparagus is a great spring veggie, and I love it roasted or grilled with just a little olive oil, salt and pepper. But it’s also delicious wrapped in pancetta, prosciutto or bacon, maybe drizzled with balsamic vinegar and baked. Salad – You can have fun with a simple spring salad, or you can put all the toppings in their own little bowls and invite guests to partake in a salad bar (which is allergy- and kid-friendly, if you’re lucky enough to have kids who eat salad). Pasta salad – Use rice noodles if gluten is an issue. Then, throw in whatever veggies you like, maybe some chicken or turkey or salami, and some olive oil, balsamic or red wine vinegar, and fresh or dried herbs. Rolls – These rolls aren’t gluten-free, but they are vegan, and I’ll be trying them for the first time this year. Fruit for dessert – Served with coconut ice cream, fruit sorbet or coconut whipped cream. Happy Easter, and Happy Cooking!